Nokia looks to reenter the US smartphone market with the Lumia 710. 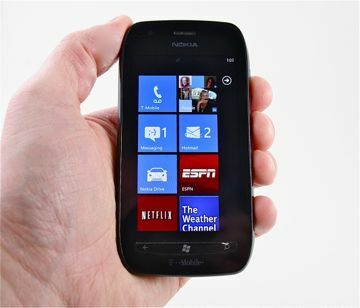 This Windows Phone 7 device hits T-Mobile USA's network January 11. Here is Phone Scoop's full review of this critical phone for Nokia. Nokia's return to the U.S. smartphone market takes shape in the Lumia 710, one of the Finnish phone-maker's first Windows Phone 7 devices for T-Mobile USA. With its $50 price tag, the Lumia 710 makes an easy choice for first-time smartphone buyers. Phone Scoop tells you if the easy choice is a smart choice in this full review. changed mind I reccomend over the Radar! Should have gone with webOS or Android. Such a shame what was once a great manufacturer have phones has come to. Really Nokia? WP7? SMFH!! Im gonna get the htc radar now instead of the Lumia. I thought I was deadset on the 710 but after reading all the incoming reviews. Others are coming in that the radars camera takes better photos & has a more powerful flash which is impt to me. So I will pick that up at the same price point with tmobile's upcoming sale starting Fri. Plus there offering the 100 dollar trade in offer still & I believe a 25.00 app card. Overall the Radar looks to be the better of the two. and I thought the 710 was gonna be..
How can I find out more about the 100.00 dollar trade in offer and the 25.00 app card? My ATT contract just ended and I want to see how good/bad T-Mobile is. What's next? A Blackberry running Windows 7.5? I kinda liked Symbian and Nokia... But I am SMH on this one... What the heck.. Does the phone you tested have both 3G 1700 and 1900 bands? Quad band GSM and quad band WCDMA. --I'm looking forward to more Windows phones.